After seeing Andrea Arnold’s quietly mesmerizing adaptation of Emily Brontë’s 1847 classic “Wuthering Heights,” I’m now hungering to see her take on other literary landmarks, particularly “The Great Gatsby.” Luhrmann’s film hammers home the meaning of Fitzgerald’s writing with such aggravating pomp and circumstance, complete with entire sections of text materializing onscreen, I was half-expecting to see a bouncing Gatsby head spring off each word as it was dutifully recited. Though Wright and Luhrmann pride themselves on their filmic exuberance, Arnold’s picture is vastly more cinematic, in part because she eliminates much of the prose altogether. 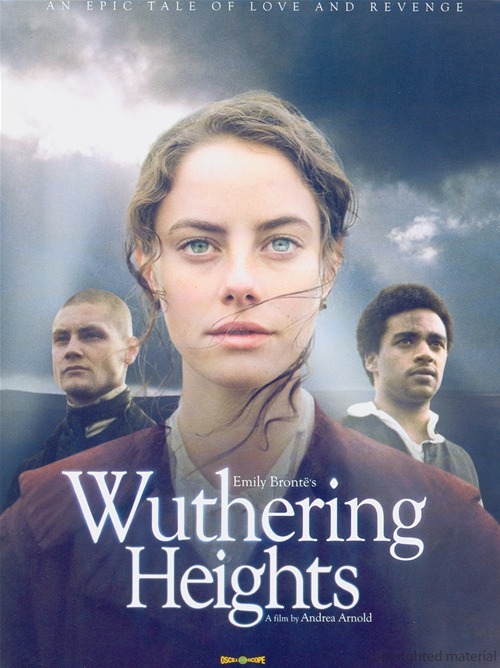 Wuthering Heights was released on Blu-ray and DVD on April 23rd, 2013. Cinematographer Robbie Ryan’s decision to shoot the film in a classical 1.33:1 aspect ratio is appropriate, since it illustrates the claustrophobia of the characters’ societally imposed prison, even as they savor the illusion of freedom. Ryan’s vivid close-ups, often viewed from Heathcliffe’s perspective, magnify the countless sublime details destined to haunt his mind in later years. He allows the audience to feel the strands of Catherine’s hair as they glide across Heathcliffe’s face, or the coldness of her tongue as it licks the bloody scars on his back left by a slave driver’s lash. Inexpressive actors may have killed Arnold’s carefully textured mood, but her two pint-sized leads are splendid discoveries. Glave has a commanding screen presence reminiscent of a young Sidney Poitier, while Beer nails the fragility of an enraptured heart. Alas, the second half of Arnold’s film is more problematic, relying too heavily on expository dialogue while recasting the central roles with adult actors so far removed from their young counterparts that they hardly seem like the same characters. Perhaps that’s why editor Nicolas Chaudeurge felt compelled to include so many flashbacks in order to evoke the magic of the film’s earlier passages. Regardless of its flaws, Arnold’s film still serves as an exhilarating model of how to truly revitalize a time-worn book for the big screen. Brontë’s language is scarcely uttered, but it haunts every frame. “Wuthering Heights” is presented in its 1.33:1 aspect ratio, and includes an excellent 19-minute video essay from critic David Fear that details the history of Brontë’s novel and its past screen incarnations. It explores Arnold’s recurring interest in characters struggling against the limitations of their environment, as witnessed in her previous two gems, “Red Road” and “Fish Tank,” and also provides some enlightening tidbits on the lives of her exceptionally gifted ensemble of untrained actors. ‘Wuthering Heights’ is released by Oscilloscope Laboratories and stars Solomon Glave, Shannon Beer, James Howson, Kaya Scodelario and Lee Shaw. It was written by Andrea Arnold and Olivia Hetreed and directed by Andrea Arnold. It was released on April 23rd, 2013. It is not rated.